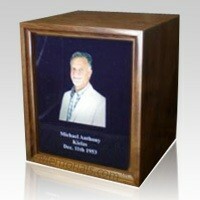 The Photo Walnut Wood Cremation Urn is made of walnut wood with a beautiful soft finish. The traditional design of the urn is elegantly accented with the beautiful full-color photo faceplate, which also holds the information of your loved one. This stunning urn will become a treasured family heirloom for many generations to come.